It’s the end of the competition, and we’ve worked hard to get here: the long nights in the machine shop, drawing 3D models, writing essays for awards and fixing our robot whenever it breaks down. But now it’s the awards ceremony at our regional, and we’re waiting to see if our team will make it to the Championships. We stay silent as the announcer describes the winning team with subtle hints. Then he gives a big clue. Wait a minute… it sounds like our team! It IS our team. We scream in joy! We’re going to the Championships in St. Louis! That was our team during the FIRST (For Inspiration and Recognition of Science and Technology) Pittsburgh regional in March. 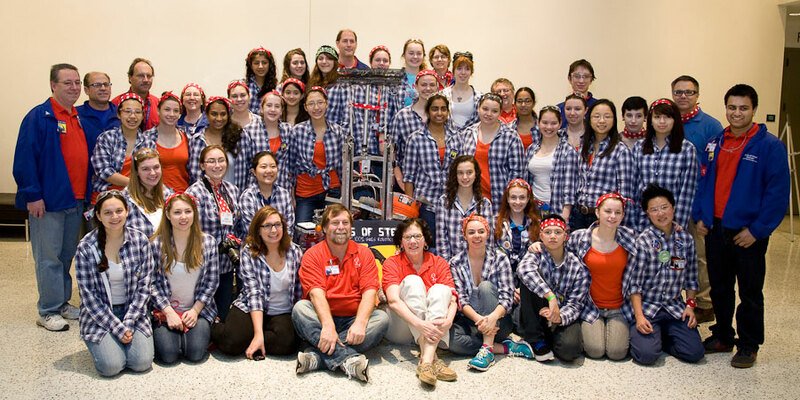 My team, the Girls of Steel, won the Engineering Inspiration Award: our ticket to the championships. Getting there was hard work, but everyone – from the mentors to the members – pitched in to get our team to that moment. It was an exciting few days after we won, but then it was back to business. We had a lot of preparation ahead of us! 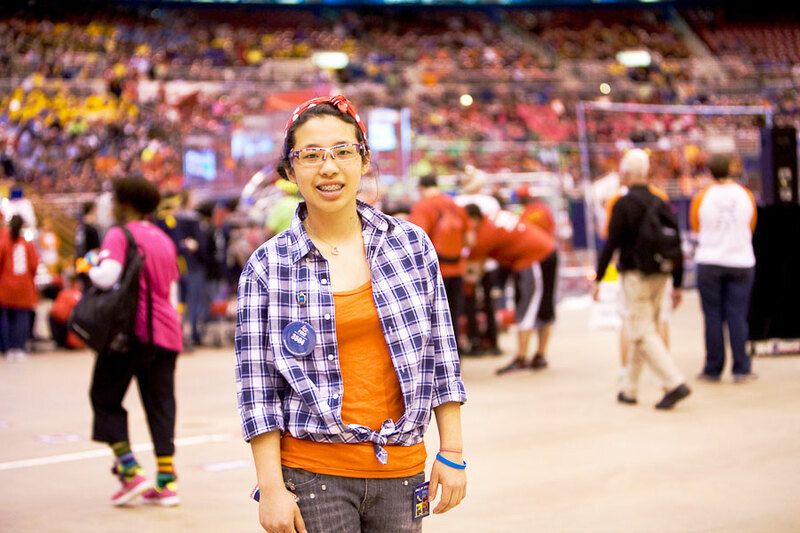 FIRST has four divisions, and my team was in the high school division FIRST Robotics Competition (FRC). FRC Teams must build a robot in six weeks to participate in this event! 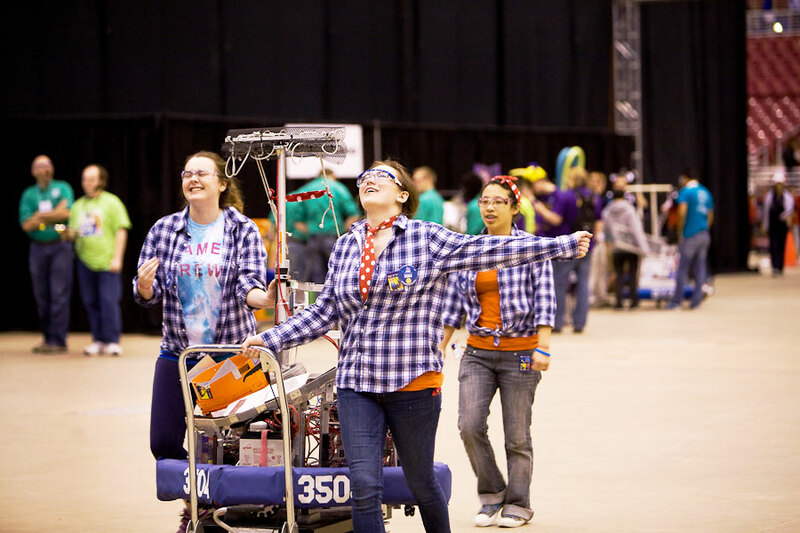 Whether by bus, plane or car, this is the day everyone arrives in St. Louis where the robots will compete. We can tell that a lot of people in the city are here for FIRST. The crowds are enormous. Three teams are staying in the same hotel as my family. We have a team dinner that night and we take up an entire section of the restaurant – a great way to bond with the girls, mentors and parents, full of laughs and good times! 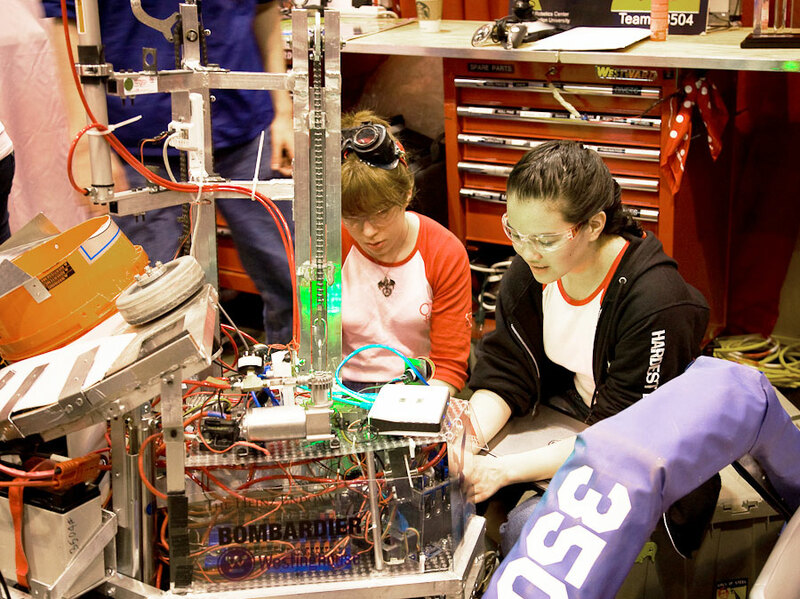 Today is the first day of competition.Practice matches happen in the morning, as well as robot inspection. 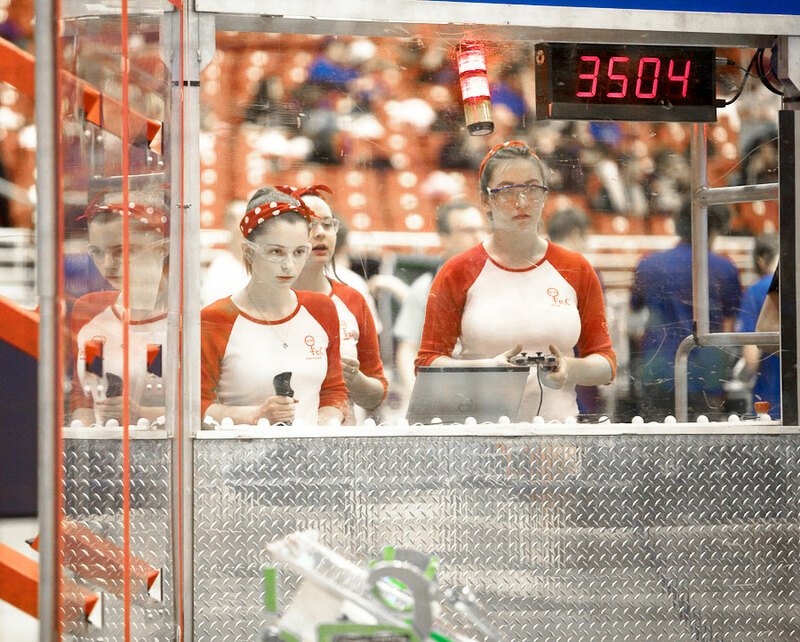 It’s a very busy time for the girls in the pit crew, whose job it is to get the robot up and working for competition. But the pit crew has done their job well: we pass inspection with flying colors. 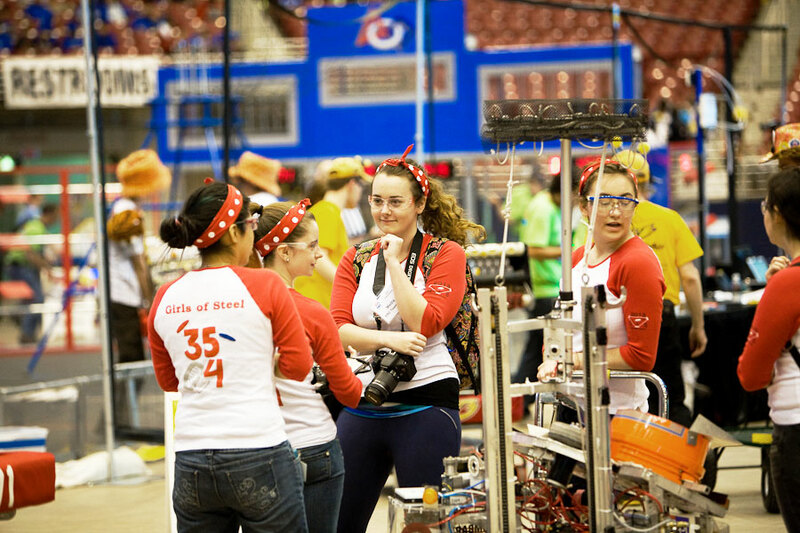 I’m on the drive team, and that makes me and the other three girls on the crew responsible for controlling our robot as it competes. During the day, we scope out our competition, which is intense – I’m impressed much of the time. Groups of three teams compete together, and so alliances are being made as teams check out how the competing robots work. 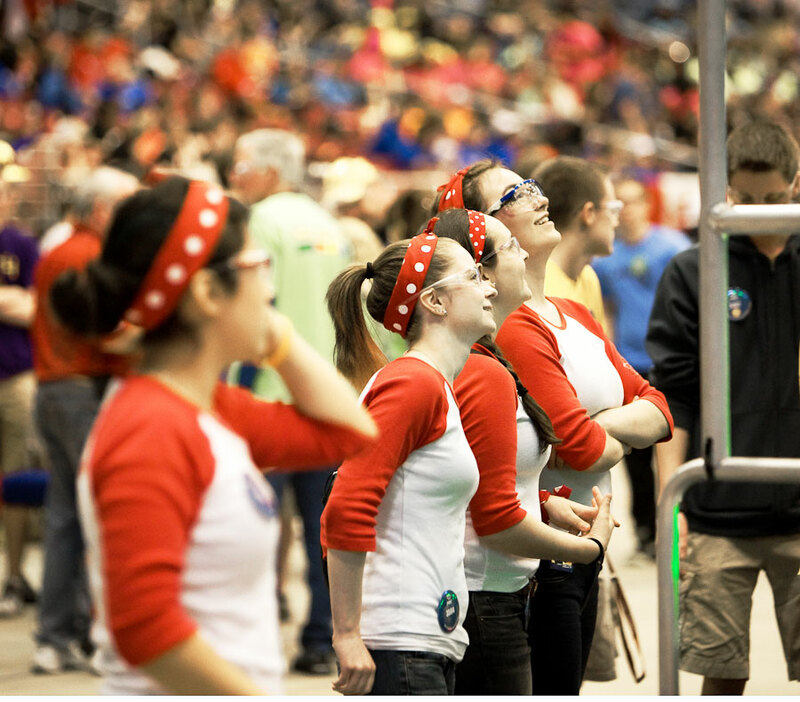 It’s important to find other teams with robots that complement ours so that we can build an alliance with no weaknesses. 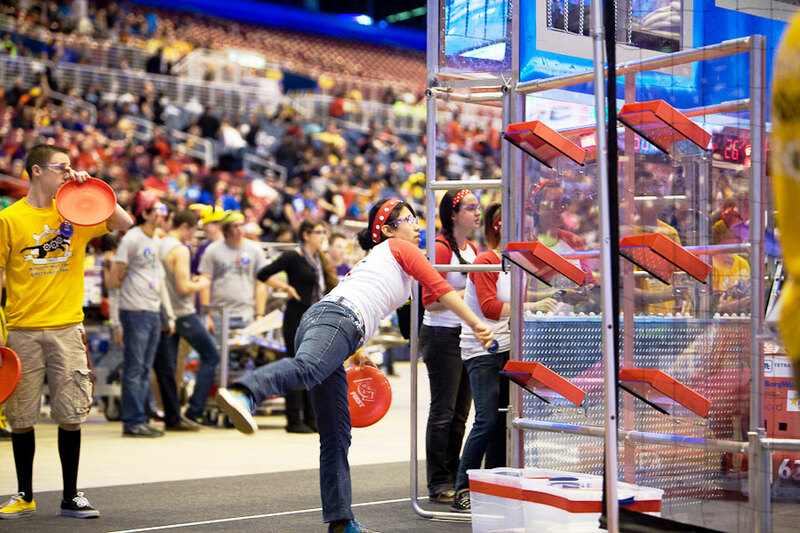 This year, the challenge is to get your robot to throw/shoot/dump Frisbees into goals at different heights. Goals are worth 3 points, 2 points or 1 point, depending on the difficulty. The best way to describe it is a pyramid jungle gym: three different sized squares made from metal tube held together with four poles, one in each corner, with a special goal on top. 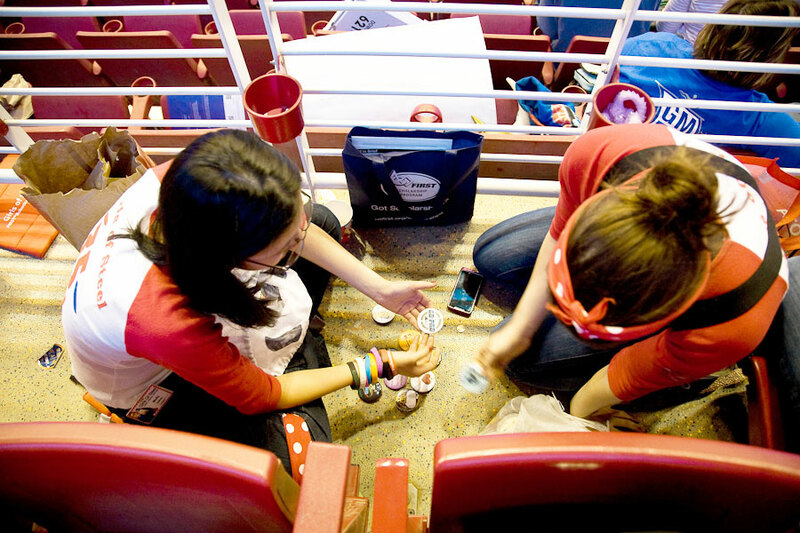 It’s a tradition at FIRST that every team has a pin to give out, and many people collect these pins and display how many they have. Some wear suits made of duct tape that hold hundreds of buttons; others wear just a few on their pant legs. I seem to get stabbed by the pins, so I just put them in my backpack. In the evening is RoboProm. Robotics. Prom. It seems odd to put these together. Well actually, it isn’t! Many seniors miss their prom to come to the FIRST Championships, so Team 339 Eagle Robotics hosts a prom annually for students. It’s an awesome event with dancing, singing and games. Opening Ceremonies. The founder of FIRST, Dean Kamen, gives a speech to all the students. 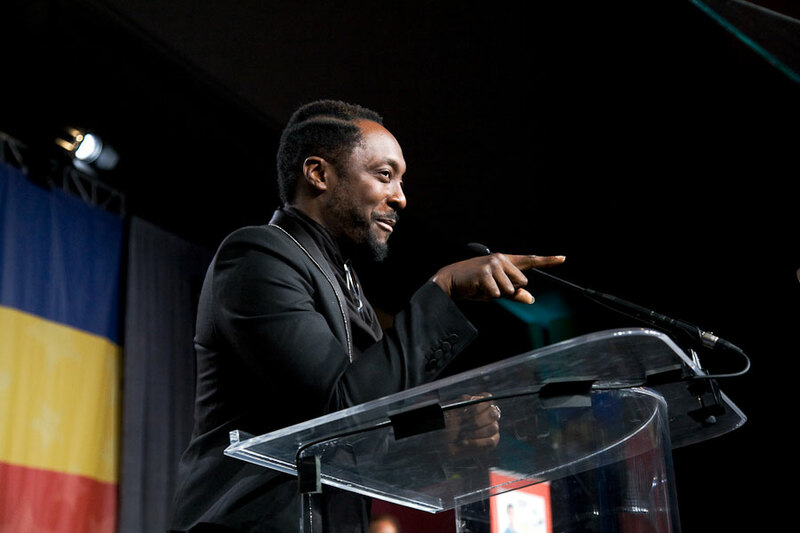 Other supporters of FIRST give speeches as well, including singer/rapper Will.I.Am from the Black Eyed Peas! I actually get to meet him for a brief moment before he goes on stage and I’m star struck. The competition begins! The Pits, a huge area where each team gets a small square to work, is crammed with people. Strategy is a huge part of this competition. Because our team is strong in shooting and maneuvering, our driver is able to outsmart and avoid some of our opponents by getting our robot to spin around. Other teams try to block their opponents’ robots from getting close to the goals, or use one robot to guard another that is capable of full court shots. Everyone is trying to expose their opponents’ weaknesses so they can win. 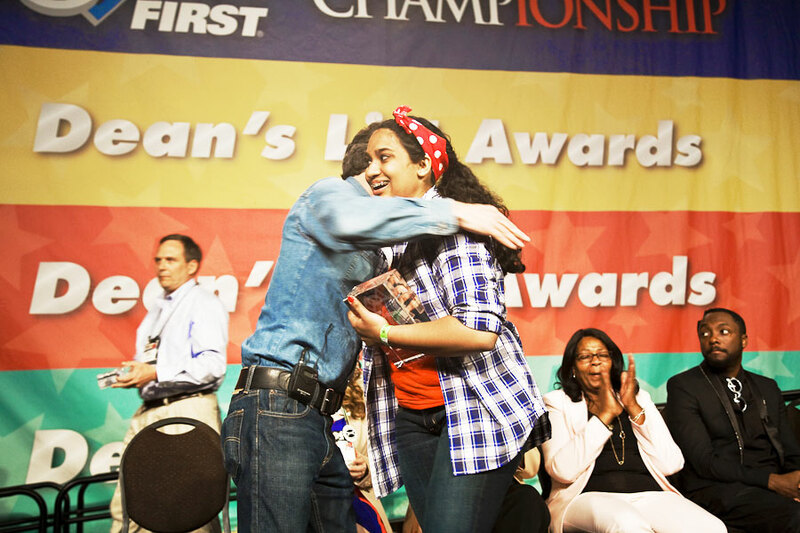 At the end of the day, the Dean’s List award finalists are also announced. The Dean’s List is a prestigious award given to ten winners from a large pool of kids that support their team and community. Will.I.Am and Dean Kamen both give speeches at this ceremony as well. One of the finalists is from our team! The last day of competition. Elimination matches take place for most of the day. Unfortunately, our team is not picked to be in the elimination, but we get to watch some great teams battle it out. 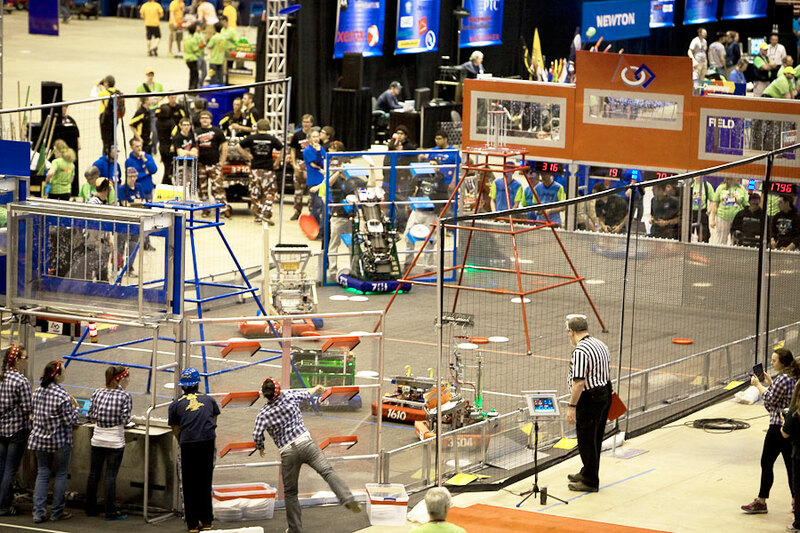 The final matches are played on the Einstein Field. It’s intense to watch both sides battling it out for the crown. Scores are hitting into the two hundreds! One alliance stands out, however. Congrats to the FRC Champions, Team 1241, Team 1477 and Team 610! It’s a long few days, but some of the hardest fun I will ever have in my life. Want to come next year? Come find the Girls of Steel, from April 23-26, 2014 in St. Louis!